El Dorado International Airport in Bogotá, Colombia is the busiest airport in Colombia and one of the busiest in Latin America, serving as the main international and domestic air gateway in the country. 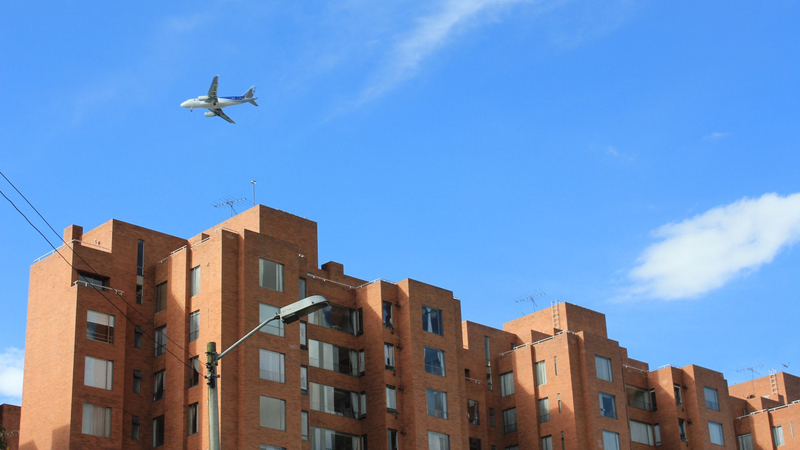 It is located adjacent to the densely-populated neighbourhood of Fontibón in the northwest of Bogotá. The airport has a long history of inadequate noise mitigation with noise levels frequently exceding national limits. The airport is currently undergoing a significant expansion in order to increase the number of flights into the country. In 2006, the Special Civil Aeronautics Administrative Unit (Aerocivil), a government agency, awarded a 20-year contract to OPAIN S.A. to expand, modernise and operate El Dorado Airport. Among other activities, the contract included the construction and operation of new, extended passenger and cargo terminals and additional aircraft docking and platform spaces, to expand the airport’s capacity. Under a separate concession, Codad S.A. (which constructed the second runway adjacent to Fontibón in 1997) undertook improvements to the runways, including improvements to and construction of rapid exit taxiways, to enable a higher rate of air operations. Air operations have already increased dramatically, increasing 22% between 2008 and 2014. By the conclusion of the expansion project, the airport is expected to host 90 air operations per hour and 40 million passengers a year, up from 50 operations per hour and 27 million passengers in 2015. The airport expansion project has been carried out by two concession holders: OPAIN S.A. and Codad S.A. In 2006, OPAIN S.A. received a 20-year contract from Aerocivil to expand, modernise and operate El Dorado Airport. OPAIN obtained financing for the project from a range of sources. In 2007, OPAIN received project financing from Bancolombia. In 2010, additional financing was provided by the Inter-American Development Bank (IDB), China Development Bank and the Development Bank of Latin America (CAF). This development bank debt was then refinanced in 2015, under the Equator Principles, by several Equator Principles Financial Institutions. In 2016, in order to fund additional works, OPAIN obtained financing from Financiera de Desarrollo Nacional (FDN), a Colombian development finance institution in which the World Bank Group’s International Finance Corporation (IFC) is an equity investor. Only a year later, OPAIN repaid FDN's loan, following advocacy by affected communities. The financing from the Equator Principles Financial Institutions remains active. (See 'Finance' for more details). Between 1997 and 2017, Codad S.A. held a separate concession to construct, operate and maintain the airport runways. For a period between 2014 and 2017, the IFC also contributed to Codad's activites, through its primary shareholder - Ashmore Colombia Fund I - in which the IFC also held an equity stake. In 2011, Comunidades Unidas, a community-based organization representing affected Fontibón communities, filed a complaint to the IDB's Independent Consultation and Investigation Mechanism (MICI) alleging violations of the Bank's environmental and social safeguards, with particular concern for noise-related harm. The complaint was found eligible for the consultation phase and MICI convened a dialogue between Comunidades Unidas, two other neighborhood organizations, Aerocivil, and OPAIN. After several years of making progress, the dialogue broke down, in large part over disputes regarding OPAIN's responsibility for the noise mitigation. MICI then made the decision to close the Consultation Phase and transferred the case to the Compliance Review Phase.On September 3, 2014, Comunidades Unidas, with the help of Accountability Counsel, filed a supplementary document, explaining the severe noise-related harm caused by the airport and the related violations of IDB policy. On November 21, 2014, MICI found the complaint eligible for the Compliance Review Phase, where it assessed whether the IDB breached its environmental and social obligations resulting in harm to communities. MICI recently concluded its compliance review investigation finding substantial non-compliance with IDB policy. See here and under 'updates' for more information. Since filing the complaint, additional investors have made significant financial contributions to the project, leading OPAIN to repay the IDB's contribution. To our knowledge, none of the institutions properly investigated or managed the risks (including health risks) associated with noise pollution from the airport. It is possible that further financing will be sought and the scope of the project changes and expands. Construction is expected to continue through until 2018-2021. Adoption of the best available international noise mitigation technology and timely evaluation of any changes made. Financers should make sure these demands are implemented by OPAIN S.A and Aerocivil. The airport expansion project has contributed to a dramatic increase in the number of air operations at El Dorado International Airport. OPAIN has expanded, and continues to expand, the domestic and international terminals and aircraft docking and platform spaces, among other works, while Codad has designed, constructed, increased and improved runway rapid exits to reduce the time that each aircraft occupies on the runway. Between 2008 and 2014, these works contributed to an increase in air operations of 22%. Between 2015 and the conclusion of the expansion works (in 2018-2021), the airport's capacity is projected to increase from 50 to 90 air operations per hour and from 27 to 40 million passengers a year. This increase in air operations exacerbates the environmental and social impacts on neighbouring communities. The noise experienced by those communities frequently exceeds national limits for residential areas: in one study, 84% of noise measurements in the areas violated the 65 dB national daytime standard, while 100% of noise measurements violated the 50 dB national nighttime residential standard. Physical buffers around the airport's runways are almost non-existant with only a road and, for some, a mound of dirt separating Fontibón residents from the runway and aircraft. 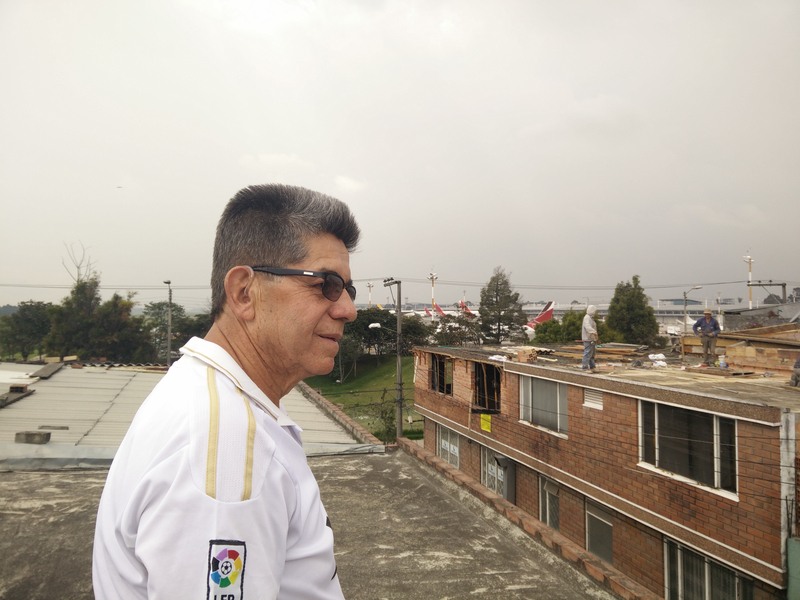 The insulation of homes and buildings is also incomplete and inadequate: a 2012 study of noise-affected areas by Bogotá's Secretary of Health (see documents) found that only 2.7% of study participants had partial sound insulation in their homes and only 1.1% felt protected from the noise. The World Health Organization warns that chronic exposure to high levels of environmental noise can lead to hearing impairment, cardiovascular disease, mental health problems, impaired cognition, and severe sleep disturbance, among other harmful effects. Children are particularly vulnerable to developmental harm, with studies finding a relationship between long-term exposure to aircraft noise and impaired reading comprehension and memory. Some of these harms are already visible in the Fontibón community. Bogotá's Secretary of Health estimates that 67% of Fontibón's population sleeps poorly, while up to 37% suffers chronic insomnia, leading to related problems with headaches, irritability, anxiety, and difficulty concentrating. Neighborhood children are especially vulnerable to health harm. “Because of the noise and the vibration I wake up scared, my heart accelerates more than it should, the arrhythmia makes me tired, causes pressure in my chest, I struggle to breathe. In college it does not happen so much, here in the house because I am scared more, it happens more frequently. Due to her condition, Luisa must reduce her physical activity. 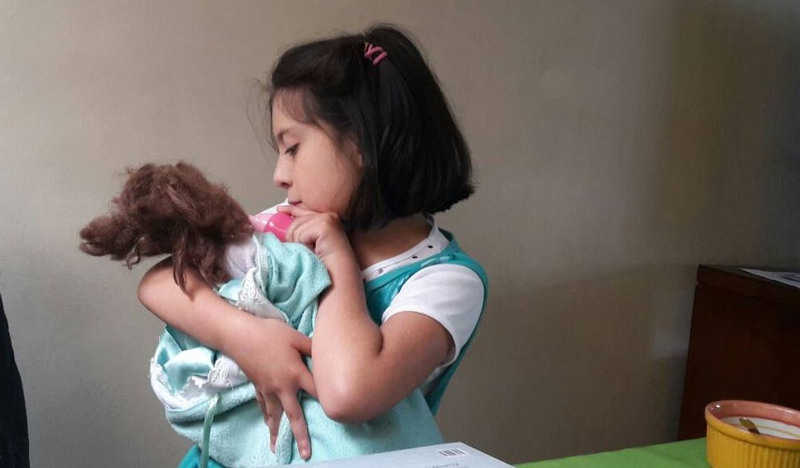 She suffers interrupted sleep, stress and difficulties concentrating and her academic performance is reduced. Multiple international studies have identified an association between elevated levels of air traffic noise, especially at night, and increased rates of heart disease and arrhythmia (see for example here, here and here). It is incontestable that applicable international standards oblige OPAIN and its investors at the very least to evaluate noise impacts and to build and use leverage to collaborate with Aerocivil to establish and monitor effective mitigation measures. We are not aware of any such steps being taken. 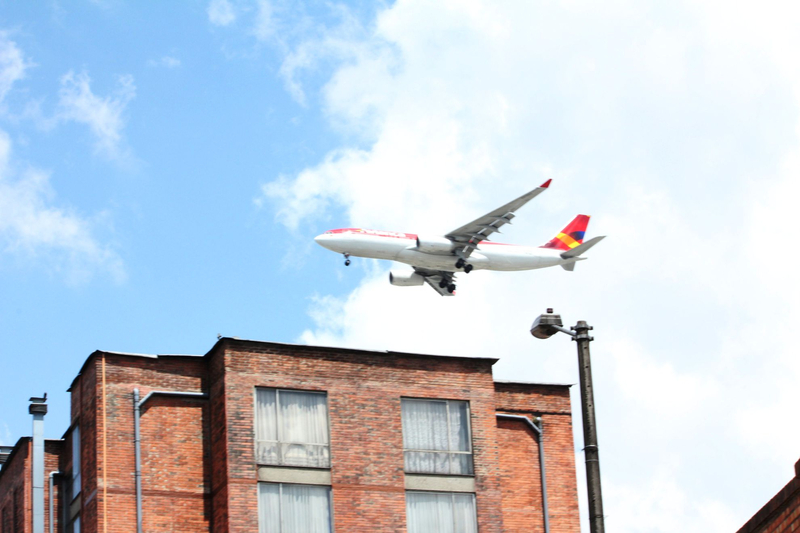 And comply with Colombia's environmental laws, including national noise standards. These failures are linked to health and stress impacts suffered by adjacent communities. The Bank and its client, the company OPAIN, failed to recognize the scale and complexity of the noise risks. 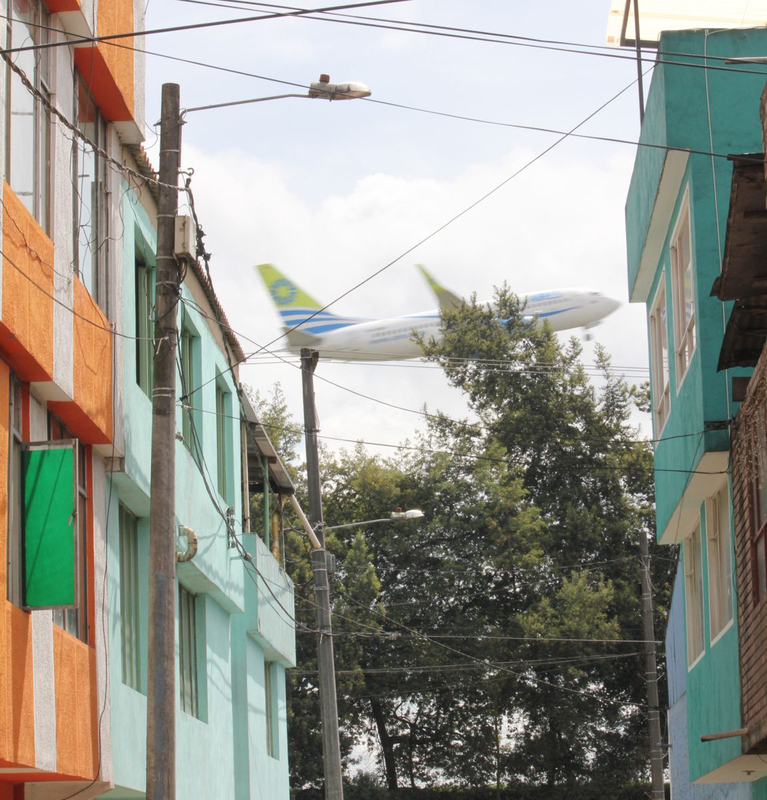 Fontibón has a population of more than 300,000 people and many of its residents live directly on the margins of the airport. The Bank and OPAIN failed to evaluate the impact that increased noise generated by the expanded airport would have on the residents there. The Bank and OPAIN failed to meaningfully consult communities before the project was approved and as it was implemented. The Bank and OPAIN failed to validate that appropriate systems and mitigation measures - including noise insulation - were in place to protect communities from the severe noise. Noise levels in the Fontibón neighborhood have frequently exceeded national legal noise limits. Yet the Bank had no system in place to monitor or respond to these violations, and therefore had no way to ensure that the project it was financing complied with national law. These failures are linked to the health and stress impacts that communities are suffering from. Studies have found that at least a third of Fontibón residents suffer from chronic insomnia and that reports of hearing damage are higher in areas with greater exposure to the noise. Children are particularly vulnerable, with studies finding a relationship between long-term exposure to aircraft noise and developmental delays. Yet the Bank made no assessment of the health risks and impacts associated with the increase in air operations. However, despite acknowledging the strength of these independent findings, the IDB does not plan to take any meaningful steps towards fixing the problems in Bogotá. The IDB Board of Directors failed to adopt MICI’s recommendation that the IDB work with relevant Colombian authorities to analyze ways to improve the sustainability of the airport, claiming that such action is out of its control, following the repayment of the IDB's loan. See here for the full blog and report. The first round of financing took place in 2007, when OPAIN received financing from Bancolombia, an EPFI. Then in 2010, OPAIN received additional project finance from three national and international development banks: the Inter-American Development Bank (IDB), China Development Bank, and the Development Bank of Latin America (CAF). In May 2015, OPAIN closed a further round of financing, to refinance its debt to the development banks and to fund additional works. Four EPFIs - Bancolombia, BNP Paribas, HSBC and Sumitomo Mitsui Banking Corporation - each contributed USD 125 million as equal partners in a USD 450 million refinancing term loan and a further USD 50 million term loan. In December 2016, Financiera de Desarrollo Nacional (FDN), a Colombian infrastructure-focused development finance institution, began disbursing debt finance to OPAIN that was expected to total 190 billion pesos (approximately USD 66 million), to fund further terminal expansion works. Major shareholders in FDN include the World Bank Group’s International Finance Corporation (IFC), the Sumitomo Mitsui Banking Corporation and the CAF. Communities were recently advised that OPAIN repaid this loan in December 2017 - only one year after it was signed - following communications from community members raising concerns about the impacts of the expansion project. Codad also received international finance for its activities, including from the Ashmore Group (UK) and the IFC. In 2014, Ashmore Colombia Fund I, a private equity fund, took an 85% shareholding in Codad. This fund is managed by Ashmore Colombia, part of the Ashmore Group. The IFC has an equity investment in Ashmore Colombia Fund I. Communities have been advised that Ashmore divested from Codad in 2017. Equity investment in Financiera de Desarrollo Nacional (financial intermediary). 8.48% shareholding (as of April 2015). Equity investment in Financiera de Desarrollo Nacional (financial intermediary). 8.84% shareholding (as of April 2015). Equity investment in Ashmore Colombia Fund I (financial intermediary). FDN provided senior debt finance to OPAIN. Although the loan is not specified as 'project finance', FDN states that the credit will be used to finance OPAIN's work on the expansion of national and international terminals of El Dorado Airport. The company holds a 20-year concession for the expansion, modernisation and operation of El Dorado International Airport. Codad S.A. constructed the second runway adjacent to Fontibón in 1997, and is currenlty undertaking improvements to the runways, including improvements to and construction of rapid exit taxiways, to enable a higher rate of air operations. 2016-09-19 11:25:50 - Explanation of the extension of the project (Spanish only). 2016-09-12 12:46:23 - Comunidades Unidas has documented the severe noise in this video. 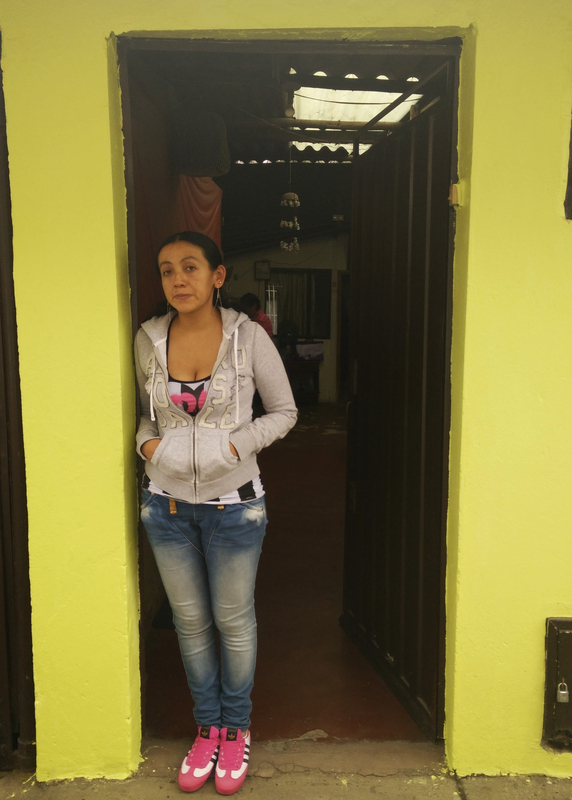 Article on Gabriela Acosta and her family living in one of the areas worst-affected by noise from the airport.